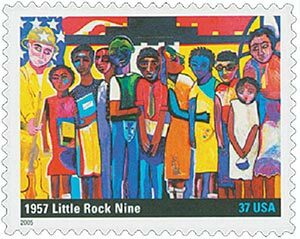 Three years after the Supreme Court ordered public school desegregation, the Little Rock, Arkansas, school board reluctantly began to comply. In the 1957-58 school year, Central High School would be integrated. About 75 black teenagers applied to go to all-white Central High, but the school board accepted only nine. Opposed to integration, Governor Orval Faubus ordered the Arkansas National Guard to surround the school and block the black students. He declared that if black students attempted to enter the school, “blood would run in the streets.” Legal action by the National Association for the Advancement of Colored People stopped the Guard from continuing to block the students. On September 23, the Little Rock Nine braved a mob outside the school to pass through the school doors. Inside, white students spit upon them, tripped them, and yelled insults. With the mob outside growing more violent, the black students were led out a rear door. President Dwight Eisenhower responded by sending troops of the 101st Airborne Division to protect the black students. The 101st patrolled outside the school and accompanied each black student inside the school. Eight of the Little Rock Nine managed to endure and finish that historic school year.